I love books (as many of you who follow my Facebook page would know) you can never own too many books. When this book landed on my table to review I was excited. Why you may ask? Surely I have read every Paleo info/cookbook under the sun? Well not quite but almost! The major difference with this book is that it is written by an Australian author something that is pretty rare in the Paleo community at this point in time. What does this mean for us? Apart from supporting a home-grown author and practitioner the book is full of practical all time favourite recipes that have been given the Paleo twist. No converting measurements, wondering where you are going to find a Bison or elk to cook up (anyone else noticed that US authored books love their bison!!?) and any sauces/condiments used are easily found without having to ship them from the US. This is a HUGE plus for me. Even though I love all my US written Paleo books to be honest with you I am not a fan of many of the “Americanised” dishes so find myself skipping those pages all together. 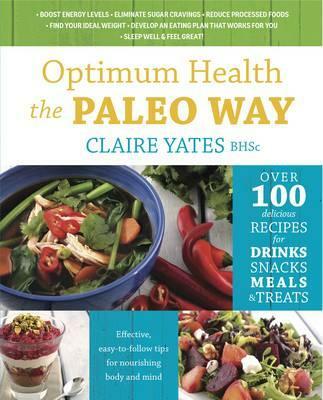 The recipes in Optimum Health the Paleo way also suit our climate and our seasonal produce. Claire also writes in a way that I think all Australians will relate well to. A bit of background info on Claire Yates the author. Claire is a Nutritional Medicine practitioner holding a Bachelor of Health Science. She is very passionate about the Paleo way of life and helps many of her clients in her private practice, Indi Nature in WA and you can also follow her on Facebook. Now onto the book, it is broken into two parts. 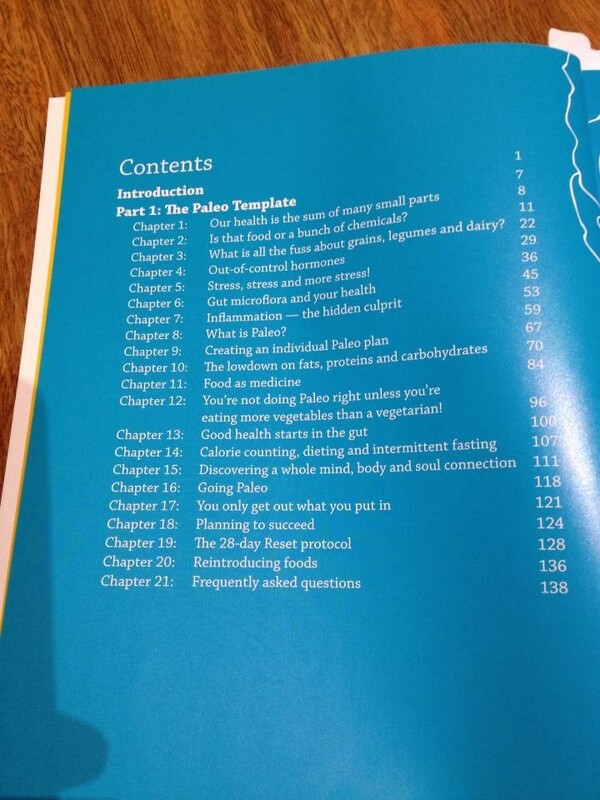 Part one is about the Paleo Template which covers all of the below topics (see image). Everything you needed to know about gut health, things that cause leaky gut, food intolerances, inflammation, what Paleo is, how to tailor Paleo to you and the all important “28 day Reset protocol” including all the tools and meal plans (huge bonus the work is done for you so no excuses!!) you need to give Paleo a go for 28 days to see if you can get down to the real cause of your health complaints or working your way to optimal health. Let’s face it everyone in modern day society has some health issue and most people have just learnt to ignore the symptoms and carry on with life. This doesn’t have to be the case! Eating Paleo and undertaking a reset program like this (or elimination diet as many would call it) removing all the problematic foods society consumes daily really allows you to listen to your body and work out all those foods that perhaps you have not associated with headaches, eczema, sinus issues, bloating etc. “You’re not doing Paleo right unless you’re eating more vegetables than a vegetarian” – This is my favourite quote from this book which I now use EVERYWHERE when people say to me “ugh, I can’t eat that much meat, that Paleo diet is all about meat”. This is the worst misconception about the Paleo lifestyle. It isn’t about meat; you build your meals around vegetables, then fat then protein. More veggies, less fruit, and LOTS more GOOD fats than we as a Western society are used to eating. Fat is not an evil word. It is the basis on how your whole body functions. Your brain is largely made up for fats about 60% in total. A newborns brain grows about three times its size in the first year of life. Starve the brain on a the recommended “Low fat “ Standard Australian diet as promoted by our Government eating guidelines and the Heart Foundation and we are a nation full of nutrient deprived people with diseases and neurological conditions popping up faster than Dr’s can diagnose them. Claire covers many fascinating aspects of how the body works, what it needs to perform at its optimal level of health and many help topics along the way to help those already suffering from a variety of health conditions. Part two of the book is recipes! Over 100 recipes for meals, drinks, snacks and treats (yes there is no deprivation living a Paleo lifestyle, the right way of doing it is just enjoying these healthier “treat” options only occasionally – they are NOT every day foods as “treats” have become in our modernised world. When you eat a diet that satisfies you and your curb your cravings you don’t miss these “treat” foods at all. I can’t even remember the last time I ate a sweet (other than a home-made coconut cream based sorbet) and I don’t’ miss them at all! The book hasn’t been written as a family cookbook specifically but there is something for everyone even if you serve it up to the kids a little differently. Some of the recipes only serve 2 so recipe would need to be doubled/tripled etc. for families. It covers everything from condiments and Paleo essentials (home-made milks, pestos, dressings etc)soups, salads, granola, smoothies, juices, side dishes, Paleo pizza! !, lots of Asian inspired dishes, meatballs/patties, sorbets, slices, pancakes, good old fashioned warming winter meals, BBQ favourites and lots lots more. Many of the meals only have a handful of ingredients which is what real food should be about; you don’t need a thousand ingredients to create a fresh, healthy honest meal. For those of you like us, who have allergies to consider there is nut & egg use in this book (as well as nightshades & FODMAPS foods) but with a few simple modifications you would be able to cook the vast majority of what’s in the book. Claire and her publishing company have given the go ahead for me to publish a recipe from the book which I think you will all love and perfect at this time of year with cherries in season. Place the cherries on the tray and roast for 20 mins. Set the cherries aside to cool slightly then place them in a blender with 1 cup of the shreadded coconut and coconut boil and blend until well combined. 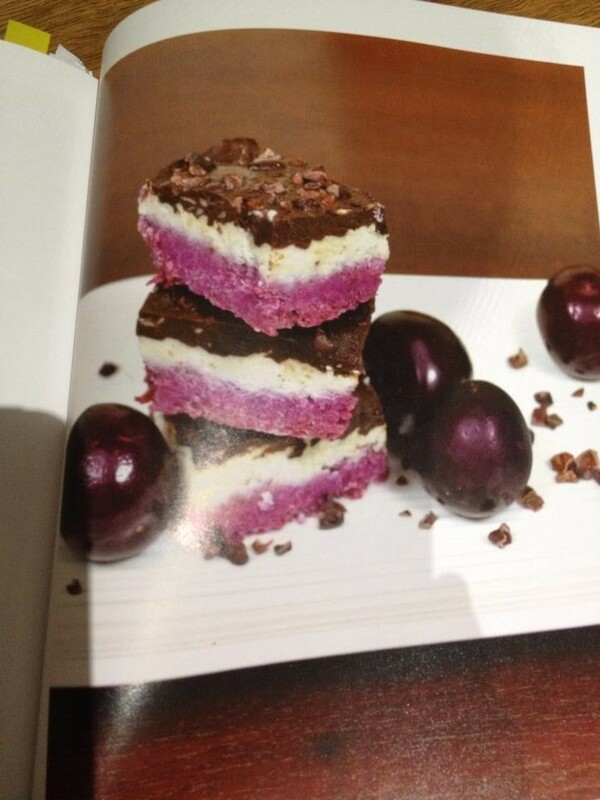 Press the cherry mixture firmly into the base of the baking tin and freeze for 5 – 10 mins. Place the cacao butter, coconut cream and vanilla bean paste in a saucepan over a gentle heat and stir until the cacao butter has melted. Mix the remaining shredded coconut and cacao butter mixture and pour it over teh first cherry layer again pressing down firmly. Place the tray back in the freezer for another 5 – 10 mins. So there you have it, not only is this book packed full of information in an easy to understand format written in a manner that makes it a pleasure to read, but it also provides you with the tools such as meal plans (which let’s face it when you’re new to a way of eating or elimination diets /reset protocol are always handy to have or even when you are simply too busy to meal plan on your own) as well as the recipes to go along with it whilst supporting a local author. What more could you ask for? I highly recommend Optimum Health the Paleo Way for a range of people, from people new to Paleo, those who are trying to work out intolerances, for those who follow the Paleo diet and just need some inspiration or even people who are just after some “clean”, wholesome nutrient dense foods the way we as humans should be eating for optimal health. You can buy the book in hard copy from here and also as an EBook if that is your preferred way to read books. So what have you got to lose? Try the 28 day reset and reap the benefits of the Paleo diet – hands down the best “lifestyle diet” I’ve ever eaten. I’d like to thank Claire and Exisle Publishing for allowing me the opportunity to review this book and for my complimentary copy. Just bought this wonderful book today – there is 40% off the entire website! I used to be a vegetarian and personally ate heaps of baked beans on toast, cereals, fruit etc but very many vegetables. Now I am aiming towards more of the Paleo/ GAPS diet I eat mainly vegetables, I love them! I crave them now!